I got up early on this September morning to enjoy a lines up of Venus, Mars, Jupiter and a thin crescent moon and hopefully my first ever viewing of Mercury from the comfort of my living room window facing East. What I got was a complete surprise, as I pondered the mysteries of the cosmos, the cosmos responded back to me with a jeering question mark! What a freak formation! So starting from the bottom of that question mark, we have the lovely earthshine crescent moon forming that full stop. Next up bright object is Jupiter, then the slightly reddish tint object above is Mars. Next bright object above that is a variable star called HIP 51264. 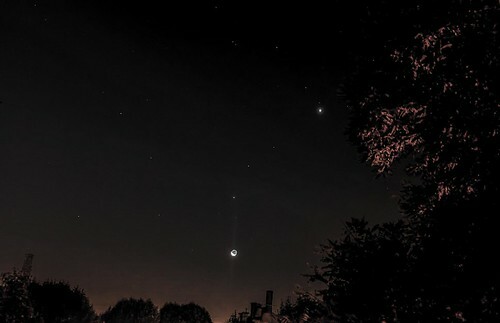 Then the brightest spiky object on the middle curvature of the question mark is the beautiful morning star itself, Venus. Next to venus on the curve is an ordinary faint reddish star but the bright blue star the follows up the curve is Regulus. In fact the top curve of the question mark is competed by the inverse question mark of the constellation, Leo, making this lineup an even more delightful irony. I took many frames, some were actually cloudless but I chose this one that had a whispy thin layer of cloud that passed by because I thought it actually looked nice.